The Levellers were a group of civilians, mainly business men and skilled craftsmen, who formed the first political group based on a democratic basis. Their 'movement'' was based on a set of common ideas and demands on the ruling classes rather than an organised political party. They met in small groups on regular basis in various London Inns, drawing up petitions against parliamentary actions and collecting subscriptions, amounts paid my members were according to income, to fund their propaganda. Petitions could have up to 30,000 signatures and in 1647, after a bad harvest and increasing starvation throughout the country, petitioned Parliament for poor relief. They also inspired many of the demands of the more radical elements of Oliver Cromwell's New Model Army. These elements were typically from the Cavalry regiments who had 'elected' spokesmen (who become known as the Agitators) to represent them. At this point the Levellers became very influential and had to be listened too. Even now, some 360 years later, some of our current politicians are said to have 'leveller' ideas and are still fighting for the same democratic changes originally proposed by Overton. The term Levellers was given to them by the King Charles as one of their aims was to level the enclosures land of the nobility. The term is also known to derive from the Levellers themselves as they declared that "all degrees of men should be levelled, and an equality should be established". The Army was now in effective control of the country and issued The Heads of the Proposals as an outline of a constitutional settlement. 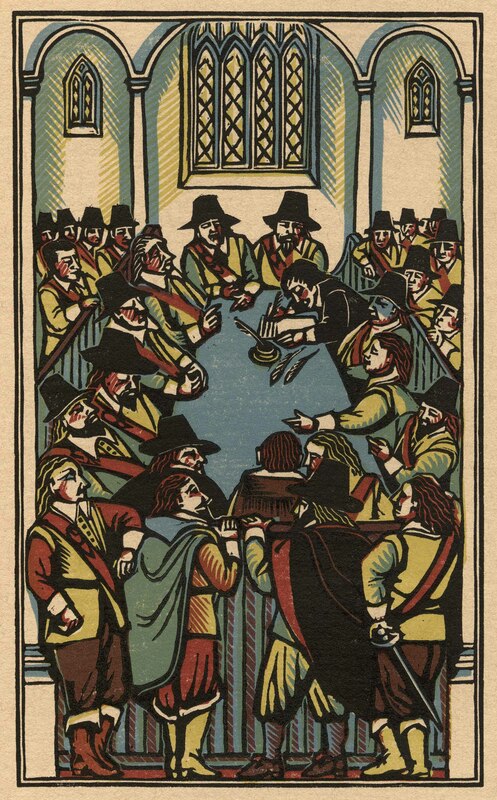 The Levellers' plan, An Agreement of the People, was more radical. Representatives of both viewpoints tried to arrive at a joint scheme during The Putney Debates (October to November 1647). Their manifesto for constitutional reform in Britain paved the way for many of the civil liberties we value today. Served in Cromwell's regiment of horse from 1643. He helped lead the Leveller soldiers in 1647, but remained in Cromwell's confidence and was made governor of Portland. He fought for Cromwell in Scotland and was sent as an agent provocateur to France in 1652-53. He grew disillusioned with Cromwell's government and in 1657 wrote Killing No Murder, an endorsement of tyrannicide. He came to England - apparently intending to act on his principles - but was arrested and died in the Tower, 13 January 1658. One of the leaders of the Leveller soldiers in 1647, and he opposed all attempts at compromise with Charles I. Yet as vice-admiral in 1648, his imperious conduct helped provoke his squadron into declaring for the King. In May 1648, while besieging Pontefract Castle, he was surprised by cavaliers and killed. Agreed with John Lilburne on political questions but, more radical in his religious beliefs, he rejected the notion of an immaterial soul, arguing that the Scripture only gave grounds for belief in the resurrection of the body. This view was seen at the time as virtually the equivalent of atheism. In 1655, he fled to Flanders with Edward Sexby, where he conspired with Charles II to overthrow Cromwell's regime. Played an important part in the army disturbances of 1647 and was imprisoned in 1648. His career of political radicalism continued long beyond the English Civil War. He was imprisoned from 1661 to 1667 for plotting against Charles II. Soon after his release, he conspired with Algernon Sidney against the succession to the throne of the Catholic James II. Wildman finally found a government he approved in the reign of William and Mary, became postmaster general and was knighted. A prosperous silk merchant, his political views were close to those other Levellers but, his overriding concern was with religious freedom, insisting that persuasion was the only proper method of religious conversion. Walwyn was imprisoned with other Leveller leaders in 1649, although unlike them he played no part in encouraging mutiny against Cromwell and the other army Grandees.